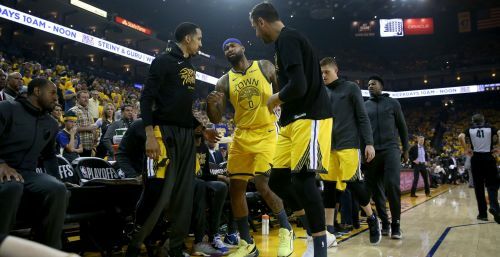 DeMarcus Cousins suffered a torn left quadriceps in the Golden State Warriors' Game 2 playoff defeat to the Los Angeles Clippers, the defending NBA champions have confirmed. Cousins fell chasing down a loose ball in the first quarter of Monday's game. Golden State coach Steve Kerr later revealed that the thigh injury was "pretty significant" and the center would be sidelined for "a while", confirming that Cousins was set for an MRI. And following an examination on Tuesday, the Warriors stated that Cousins would be out "indefinitely" due to the tear, seemingly making it unlikely he will feature again in the playoffs. "Warriors center DeMarcus Cousins, who exited last night's Game 2 against the Los Angeles Clippers with 8:09 remaining in the first quarter, underwent an MRI exam earlier this morning in the Bay Area," a team statement read. "The MRI confirmed that Cousins has suffered a torn left quadriceps muscle. The injury will sideline Cousins indefinitely and he will begin rehabilitation immediately. "Updates on his progress will be provided as appropriate."